The system was simple. Everyone understood it. Books were for burning, along with the houses in which they were hidden. Guy Montag was a fireman whose job it was to start fires. And he enjoyed his job. He had been a fireman for ten years, and he had never questioned the pleasure of the midnight runs or the joy of watching pages consumed by flames, never questioned anything until he met a seventeen-year-old girl who told him of a past when people were not afraid. Then Guy met a professor who told him of a future in which people could think. And Guy Montag suddenly realized what he had to do. Ray Bradbury (1920-2012) was an American novelist, short story writer, essayist, playwright, screenwriter, and poet. 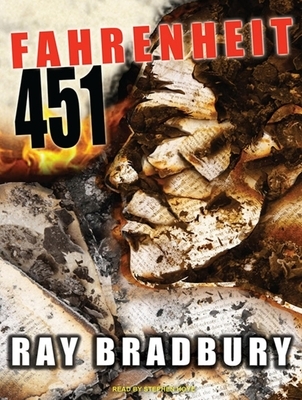 Among his best-known works are "The Martian Chronicles," "The Illustrated Man," and "Fahrenheit 451." Stephen Hoye has won more than a dozen "AudioFile" Earphones Awards and two prestigious APA Audie Awards, including one for "Rich Dad, Poor Dad" by Robert T. Kiyosaki. He has recorded many other notable titles, such as "Every Second Counts" by Lance Armstrong and "The Google Story" by David A. Vise and Mark Malseed.